It is killing me that I missed out on some great weather this year. 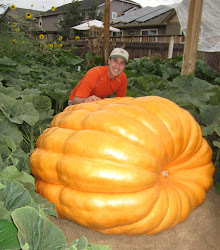 Lots of big pumpkin at the weigh-offs in Colorado this fall. Each weigh-off has had a pumpkin over 1,300 pounds with two weigh-offs having pumpkins over 1,400 pounds. Some really good growers stepping up in Colorado this year. Next week is my weigh-off. I'll be lucky if I get to half of my goal for the season, but I get excited for the weigh-offs just the same. Tonight I gave the pumpkin plants a foliar application of TKO with a little calcium nitrate. I'll probably give the plants one last application of fertilizer on Tuesday and then we will be done for this year and hope for the best.